Mr.Modi Government -The Process and The Result is good to all community people in India. 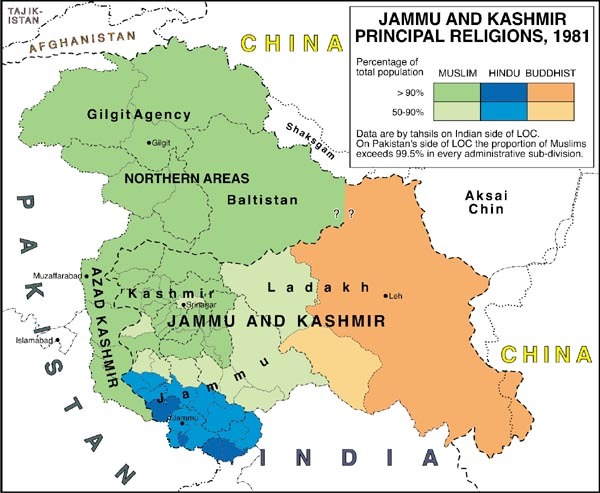 While a clear majority of the Muslims in Jammu, in Kashmir proper, and in Azad Kashmir are followers of the Sunni form of the faith, large areas in Indian-held Ladakh, most notably in Kargil district, and in the Pakistani-held Northern Areas have majorities who follow various sects that may be grouped under the label Shiah. These include the Ismailis, whose spiritual leader is the Aga Khan, whose Aga Khan Rural Support Programme is a major source of development assistance to the region, on both sides of the LOC. Reliable statistics on sectarian distributions within Islam have never been collected. However, based on such pre-independence data as do exist, Shiahs (of various sub-sects) outnumber Sunnis in Indian-held Kargil, while, on the Pakistani side of the LOC, they lead in all parts of the Northern Areas except Gilgit tahsil of Gilgit district and the western tahsils of Diamir district. In those areas, owing in part to immigration from Punjab and the North-West Frontier Province since the completion of the Karakoram Highway, the two sects are believed to be in rough balance. n= negligible (i.e., less than 50 individuals or less than 0.1%). Minority faiths in the Indian-held areas of Jammu and Kashmir also include the Sikhs (who number 133,675, or 2.23%), settled mainly in Jammu; Christians (8,481); and Jains (1,576). Minority religions in areas held by Pakistan are of no significance. Today their was a case heard by Supreme court of India on this Minority status to Muslim/Islam People at Kashmir since they were the Majority in the population of this state in Union of India. Supreme court of India questioned Union Government of India to answer to this ? Minority status to a community was considered on the basis of population Percentage of a community in total population in the entire India. The minority status was not a provision to a community on its population strength in a single state in India. so In my ultimate recommendation in my Opinion /view to Supreme court of India and to Union Government of India by B J P headed by Mr.Narendra Modi. Mr.Modi will definitely agree on my Opinion and may wish to direct the Union Government of India by B J P to reply my view as their reply to Supreme court of India. Off course Islam/Muslim is the Second Largest Religious community maintains the Second Position in total Population of the world . Also to Note Most of the Islamic countries were found to be very rich in wealth and Prosperity ,But still waiting to find and open ways and means to support and help People belongs to Islam /Muslim living across the world to Prosper. If this happens Than Islam community will not agree to live on Minority Status is my Humble OPINION. I STRONGLY BELIEVE THAT SUPREME COURT OF INDIA MAY AGREE MY OPINION .